Blazers are the must-sew item this season and the Jasika Blazer is a classic tailored jacket with a semi-fitted shape that will never go out of style. With just the right amount of polish and detail, this blazer is a wardrobe workhorse and a mighty skill builder. 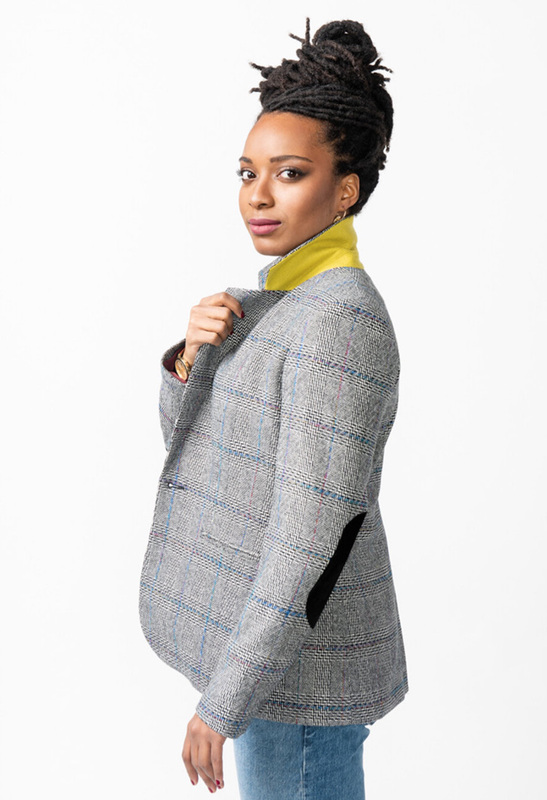 The instructions use modern speed tailoring methods, fusible interfacings and minimal hand sewing to make tailoring fun and accessible for everyone to make a blazer that you'll want to wear forever! This jacket is fully lined and features a classic notched collar, single button closure, back vent, shoulder pads, welt pockets, gorgeous two-piece sleeves and a flattering shape that skims the curves of the body. Optional details include pocket flaps, topstitching, decorative sleeve cuff buttons and leather or suede elbow patches. Available in size 0-20 (US). The Monna is a next genberation of hoodie! Featuring a flattering gathered bodice to a yoke with added faux piping design, complete with welt pockets and a perfect hood! This is not your typical hoodie – t’s a must-make! Fabrics suggested for this pattern include stable knits such as cotton lycra, French terry, ponte, activewear knit or scuba. However, any knit with at least 30% stretch will work well. Many sewers asked for an adult version of the jacket, so Pauline Alice has made it! The Serra jacket sewing pattern takes its shape and details from the mini coat to create view A, which is an (yes for the guys too!) with raglan sleeves and fully-lined. The Serra jacket was the perfect to try the multi-purpose versions: with its simple shape, so the designer has worked on different lengths and details to propose a 3-in-1 pattern. Three views for three different styles and uses. View B features a shorter jacket with hood and athletic style while view C is knee-length jacket with trench coat details making this pattern the base for lots of possibilities. Aavailbale in sizes XS-XXL. A verstaile pattern to make a bathrobe, kimono or beach cover-up! Wear as a poolside cover up, traditional bathrobe as a layer of winter cosiness or open as a gorgeous kimono. This PDF sewing pattern has a relaxed, loose, comfortable fit with a dropped shoulder and the option to add patch pockets and a hanging loop. It also features a customisable collar, belt loops, and belt and is suitbale for both knit and woven fabrics. Perfect for beginner sewistas and includes pattern pieces and full tutorials with step-by-step instructions. It comes in unisex adults' sizes 1 to 5 and unisex children’s sizes newborn to 12 years so you will be able to make the whole family one! This fleece jacket PDF sewing pattern for men is a slim fitting jacket with contoured seams on both body and sleeve. The raglan sleeves are designed with a seam from the shoulder to the wrist. The jacket has front pockets with invisible zippers set in the seams, as well as a handy inner pocket with a zipper. The design is sporty and perfect for colour blocking and getting your guy to wear colour! Make the jacket with a stand-up collar or a hood. Available in sizes 2XS-3XL. Designed for less stretchy knit fabric such as sweatshirt knit and double knit, the Orono Top is ideal for wearing over a T-shirt or a shirt. However this easy-to-sew top has a bit of a twist on a plain sweatshirt with an overlapping petal-like front and high-low hem, as well as some functional pockets! The top also features a stand-up collar, long raglan sleeves with shoulder darts. This top sewing pattern is great for beginners and comes in sizes 00-20 (US). Comfy and casusal, this trouser sewing pattern is ideal for some weekend relaxing! The Darlow pants are a cropped, tapered trouser full of interesting panel lines and detailing. They have been designed to give a new spin to the classic trouser and can be worn as an easy and casual option or dressed up for a nice evening option. The trousers sit on the natural waist and feature a fly front with zip closure, shaped waistband, in-seam pockets, back pockets and hem facings. Also designed to be quite fitted through the waist and hip, before more volume is added through the leg, for an interesting shape. View A has slightly more volume through the leg than View B, and features patch pockets, while View B has back welt pockets. Both comprise a number of interesting shaped panel lines that encourage a unique shape and an interesting experience. Some of the photographs have the panel lines drawn on, so that you can get a better idea of how the panel lines work on the body. The Darlow pants are beautifully crafted and carefully drafted to include many interesting details, to make this a very enjoyable sew for confident sewers. The pattern comes with fully illustrated instructions to hold your hand every step of the way which can be printed at home, or simply viewed on a computer or tablet. The Ursula Dress is a simple sleeveless shape with a cross back bodice with two neckline options - round and V-neck. The inverted pleats on the bodice provide great shaping and extra detailing and are followed through onto the skirt. Make within-seam or patch pockets to complete your look. Available in sizes 8-22. This beautiful jacket is so versatile and perfect for putting on top of a range of different outfits and keeping you covered! The Long Line Jacket from Sew Different is a gently fitted long jacket with deep pockets and raglan sleeves. It has an empre line waist point and the bottom hem sits mid-thigh, with the option to extend the length. Most medium to heavy weight fabrics will work for this jacket. It would be lovely in a wool or mohair for the summer. It could look fabulous in corduroy or suiting fabric and in a velvet for a show-stopping theatre outfit. 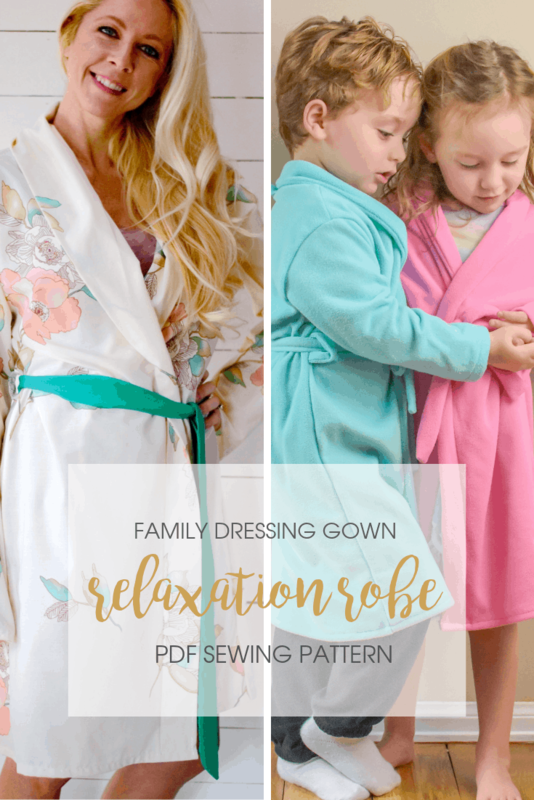 This PDF sewing pattern is available in sizes 2-26. The Bonita Dress is a soft and fluid style that’s perfect for warm weather and ideal for work and weekend wear. The dress sewing patterns features a delicate wrap front with a soft drape at the waist to enhance the silhouette. This dress and top has a flattering V-neck, feminine fluted elbow-length sleeve and a soft wrapped belt. Make in rayon, silk, jersey or any soft flowing fabrics. Available in sizes 4-30. Gym to grocery shopping - this top will be your new best friend! The Street to Studio Top has your back! With lots of different necklines, you can show off your back or go simple with the crew back option for full coverage! This sewing pattern has just enough options to give you a big variety of looks without being overwhelming. Download this sewing pattern now for $12 from Greenstyle Creations and start sewing today! Although very Parisian-inspired, the wrap top VONDEL is named after the Vondelpark in Amsterdam - a park where the designer, Meghan Halfmoon, has spent countless, blissful hours biking, playing with my kids and relaxing on picnic blankets. Wrap top/dress sewing pattern Vindel is a feminine, easy-to-wear true wrap with a deep V-neck and a long waist tie to close. It features a one-piece shoulder yoke with a curved centre back and front and back gathers for additional shaping. With three sleeve length options - cuff, half-sleeve and 7/8-sleeve - as well as three lengths - top, short dress or midi dress - you can make a different Vondel for every occasion. This pattern includes French seams, the burrito method and other creative techniques to achieve a beautiful clean finish. Thanks to detailed illustrated instruction, this is the perfect pattern to learn French seams or to up your sewing game! Available in sizes 1 to 10 - check the Halfmmon Atelier size cahrt tofind your size.